“Collections: A Visual Journey of Art Through the Eyes of Sherry Whetstone-McCall” at the Stocksdale Gallery at William Jewell College scores successes for both gallery and artist. William Jewell College ended its visual art degree program in 2018. Whetstone-McCall’s exhibition marks the beginning of the Stocksdale Gallery’s new partnership with the Liberty Arts Commission and sets a high bar for the newly invigorated gallery. 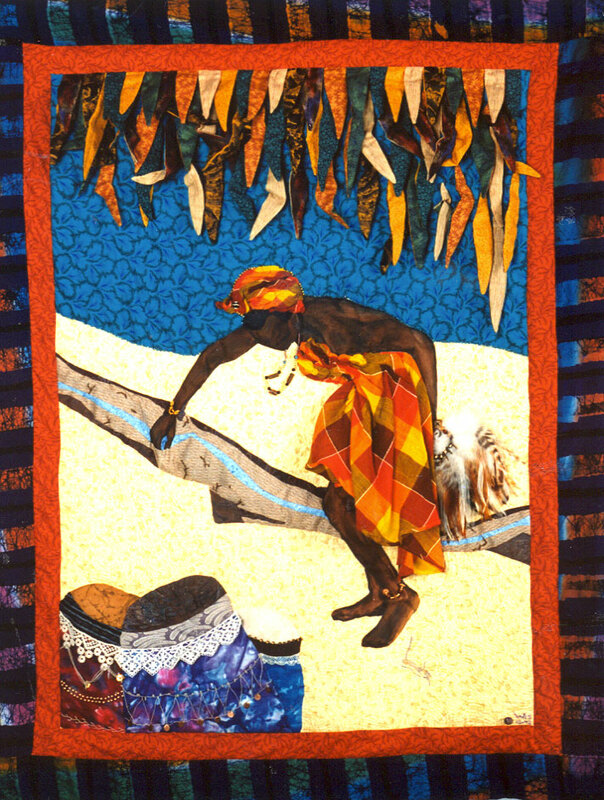 Most of the exhibition is devoted to Whetstone-McCall’s colorful, visually sophisticated quilts that often charm viewers with their playfulness and accessibility. The small work “Crossroads” exemplifies many of the artist’s creative interests and concerns. 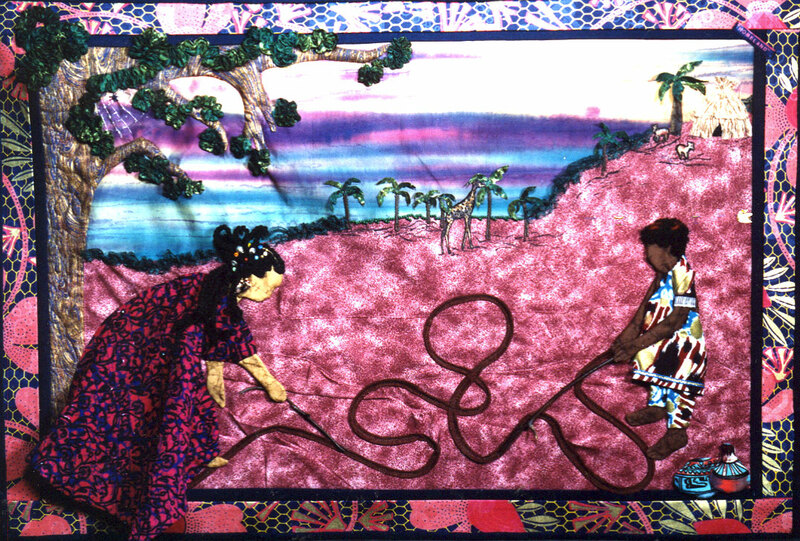 The border of the work features patterns that seem to be inspired by African textiles, while a small mask sewn to the interior also suggests Africa. Whetstone-McCall asserts that cowrie shells in the work are symbols of royalty, money and fertility. 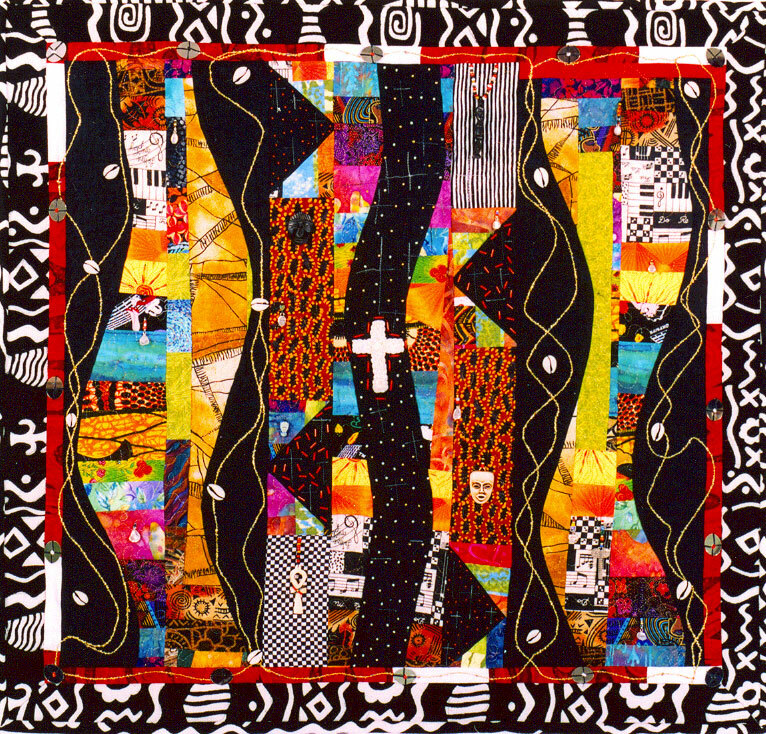 A cross sewn into the center evokes the quilt’s title, while a small ankh symbolizes life. Music appears in the work via an image of a piano keyboard and snippets of notation. The entendre-filled “My Hands Would Rather Play Her Bass” riffs on sensually shaped images of a saxophone and a bass in the work, as well as a pair of drumming hands. The word “JAZZ” inscribed on the bass suggests associations between love and music, while an image of a woman in African attire brings to mind the African roots of jazz music. “My Plate or Yours” also plays with love. A couple dressed in vegetation-like garb dances while two women observe. An inscription above hints at their disapproval: “My French onion dip brought them together! Girlfriend, you know it’ll never last. He’s too fresh!” One member of an asparagus-shaped couple in the background whispers “She only has eyes for the big carrot guy.” In this quilt, Whetstone-McCall breaks the picture plane with the tablecloth of a food-laden table and with the dresses of the onlookers, employing a highly effective compositional device that makes the work more accessible by bringing the action into the viewer’s space. “My Plate or Yours” was inspired by a friend of the artist who ran a catering business. The lighthearted nature of the work becomes troubled upon learning that the caterer friend was later killed in an act of domestic violence. Other works allude to more personal and thought-provoking themes. Whetstone-McCall began “For My Son” while her son Ronald was in hospice. Her close friend, the fiber artist NedRa Bonds, gave Whetstone-McCall a random grab bag of fiber scraps for her to busy her hands and comfort herself. In the grab bag, she was surprised to find a number of items that related to her son and his interests, which she incorporated into this quilt. A mask refers to his collection of masks, while images of Iron Man and Wonder Woman recall his love of graphic novels. A butterfly symbolizes his transition from this life. As an homage to Ronald, Whetstone-McCall included works by him in a heartwarming area of the exhibition, accompanied by a work by the artist’s daughter. Outstanding art by Bonds and other artist friends also appears in the show, including Clarissa Knighten, Sonié Joi Thompson-Ruffin, and Dale Maginness, who was one of Whetstone-McCall’s earliest collaborators and mentors. The exhibit is a testament to the efforts too, of Nathan Wyman, professor of theatre at William Jewell and Carol Kariotis, both members of the Liberty Arts Commission. Wyman directs the Stocksdale Gallery and serves on the Arts Commission as a liaison for the college’s arts and cultural events; Kariotis curates the gallery. Kansas City-area readers may be familiar with Kariotis through her former executive director roles at The Writer’s Place and Kaw Valley Arts and Humanities. “We wanted to get the very best show for our first show,” said Kariotis, who was familiar with Whetstone-McCall’s work through the artist’s shows with Kaw Valley Arts and Humanities, Mid-Continent Public Library in Liberty, and the Garrison School Cultural Center, also in Liberty. Kariotis and local and regional presenters are not the only fans of Whetstone-McCall’s work. She has also shown in nationally touring exhibitions and in venues such as the American Folk Art Museum, the Renwick Gallery of the Smithsonian American Art Museum, the National Underground Railroad Freedom Center, and the United States Embassy in Lilongwe, Malawi. But for the artist, the Stocksdale show is a milestone. “Collections: A Visual Journey of Art Through the Eyes of Sherry Whetstone-McCall” continues at the Stocksdale Gallery, Brown Hall, William Jewell College, 500 College Hill, Liberty, through Feb. 22. Hours are 10:30 a.m. to 5 p.m., Monday – Friday. For more information, 816.781.7700 or www.jewell.edu.